Sociometry provides a means by which peer group researchers can conceptualize and measure the interpersonal forces of attraction and repulsion within the peer group system. The literature on developmental psychology has addressed the use of sociometric methods since the 1930s, and researchers have used these methods extensively during the last fifteen years. The application of sociometric methods presents challenges that are both conceptual and psychometric. 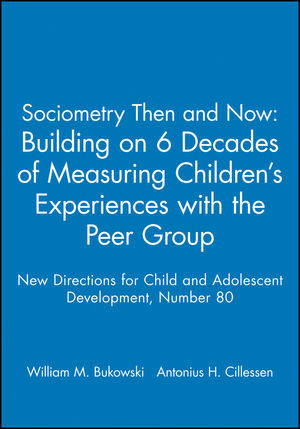 This volume of New Directions for Child Development discusses the conceptual foundations of sociometry and recent methodological advances in sociometric techniques. The goal of this sourcebook is to show where sociometric methods and constructs came from and where they are going. This is the 80th issue of the quarterly journal New Directions for Child Development. WILLIAM M. BUKOWSKI is associate professor and chair of the Department of Psychology of Concordia University, Montreal. ANTONIUS H. CILLESSEN is assistant professor in the Department of Psychology of the University of Connecticut.